Edmund Köster (1896-1943) was a great modelmaker and producer of waterline wooden ship models in Germany in 1930's. His shop ( Köster- Schiffe) successfully functioned between 1932-1939 in Hamburg. Köster models were used by the German Navy, Travel Agencies, Port Officials, Fishing companies in their offices and as ID and promotional models. News-papers of that time called Köster an "Artist", "Master of Visual Effects", “Master of Abstraction". 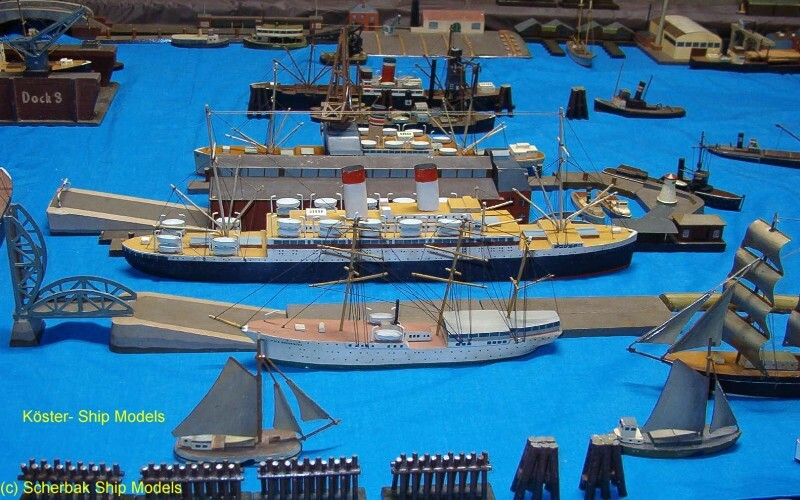 His models ( mostly in scale 1:400) were simplified, but made as lovely and exact reflections of the general appearance of ocean liners, cargo ships, warships, fishing vessels and other kinds of ships. At the same time waterline wood ship models were produced in Great Britain, by Bassett Lowke, and in USA, by Van Ryper. Köster became especially famous for building large port dioramas the largest of which was the spectacular 75 square meters diorama of port of Hamburg in the 1:400 scale. This diorama did not survive the Second World War. Edmund Köster died in 1943 and all his production became short lived, extremely rare and very demanded by collectors. After the war, a similar style of ship modelbuilding was adapted by some other German producers. A large exhibition of Köster models was organized in Hamburg in 1996 to commemorate the 100th birth-anniversary of the famous artist-modelmaker. Today Köster models are rare, mainly forgotten in Germany and almost unknown in the US. Talk to any noted collectors of ship models - they will be surprised by the name Köster and his models...!